The Dagrin Movie Project recently got a major boost as the producer of the movie, Ope Banwo acquired the exact Nissan Maxima in which Dagrin had the ill-fated accident that led to his death for a huge sum of money. Investigations revealed that the decision to use the Nissan MAxima with customized plate Dgrin 03 was birthed by Barrister Ope Banwo who suggested that for justice to be done to the movie, it is necessary to use the exact car in which Dagrin had the accident in recreating the fatal accident. The car which had been sold to scrap dealers in Owode Oniran was first priced at one million naira a price that Ope Banwo did not find palatable but due to the importance of the car to the development of the story, Ope Banwo continued with the negotiation and soon brought Rachael Oniga, a cast of the movie who knows some big boys in Owode to be involved in the deliberation; it was later agreed that the car be sold for half a million naira. When asked why he is willing to spend so much money on a car that was damaged beyond repairs, Ope Banwo said ‘once you decide to do a biopic, there are some things you have to do to create as much realism of the real story as possible. There are some things you should not compromise as a producer if you really believe in doing your best for your audience”. When asked what he would do with the N400,000 worth of scrap metal once the movie is done, Ope Banwo said he is not sure right now. He said he may probably donate the car to the museum since the Dagrin accident has become a national event. 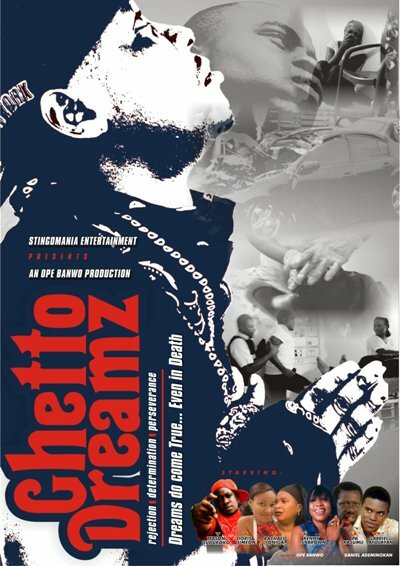 Ghetto Dreamz stars a budding music star Trybson Dudukoko, Doris Simeon, Rachael Oniga, Pa Kasumu, Kenny ST Brown, Jaywon, Gabriel Afolayan and fast rising Oyindamola Odesola among others.